First and Second: The same as the first two movements of "Many Stars." Third: Bend each middle finger down toward you over the index strings, and take up from below, on the back of the finger, the far thumb string, and return the middle finger to its position. Fourth: Separate the thumbs widely from the other fingers, and laying the figure on the knee, withdraw the thumbs gently, and pick up through the thumb loop, on the back of the thumb, the far little finger string. Take the figure from the knee and draw the strings tight. 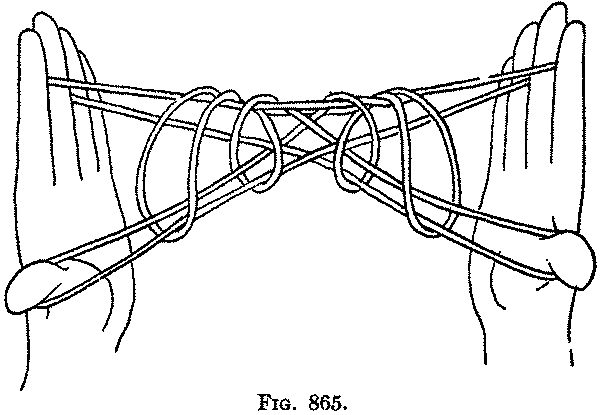 Fifth: Wrap the far middle finger string once around the little finger, turning the string away from you and then toward you. Slip the lower, original, little finger loop over the upper loop and off the little finger. Repeat on the other hand. Sixth: Transfer the index loop to the thumb; slip the lower, original thumb loop entirely off the thumb. Seventh: Release the loops from the little fingers and draw the hands quickly apart (Fig. 865).